UNTIL recently, when the appearance of Britain's turboprop and turbojet airliners began to alter the picture,the world's main source of transport aircraft was firmlyestablished in the United States. And, in the U.S.A., it was to the Douglas Aircraft Company that a great many airlines went for their machines, since the introduction in 1933 of the DC-2, most significant aircraft of its time. Following the success of the K.L.M. DC-2 which, carrying a full load of passengers, came second only to the first D.H. Comet in theEngland-Australia Race of 1934, the interest of many of the world's operators was focussed for the first time on this Douglas product, which was already laying the foundations for a long record of reliability, versatility, and relative economy for domestic airlines in the .U.S. The subsequent success story of the DC-3 (some 1,500 of which are estimated to be still in use at present)is now well known, as is that of the four-engine DC-4 which followed it. Successive processes of "stretching" through the DC-6, 6A and 6B have now resulted in the DC-7 which, with the same span as the DC-4, has a fuselage 15ft longer and a vastly improved performance. The appraisal which follows describes the main features of this aircraft and includes the first-hand impressions of the Editor when he recently flew in the machine and visitedthe Douglas factory at Santa Monica, California.Design.—The DC-7 is basically a development of the DC-6B, and a few details of this latter machine may be recalled withadvantage before the "Seven" is considered. The DC-6B, passenger version of the DC-6A, is well known as an efficient,conventional transport aircraft in the American manner. It is of semi-monocoque all-metal construction with flush-riveted skin and, powered by four Pratt and Whitney F-2800 Double Wasps, can carry between 54 and 92 passengers according to the type of service. The span is117ft 6in and length 105ft 7in. Normally the empty, take-off, and landing weights of the DC-6B are54,148 lb, 106,000 lb and 88,200 lb respectively; the improved Super Six" version of Pan American carries 82 passengers on transatlantic tourist-class operations and has been certificated for a gross take-off weight of 107,000 lb. Cruising speed is 307 m.p.h.at 22,400ft, normal range 3,860 miles (absolute range 4,910 miles), andwing loading 72.5 lb/sq ft.fhe main aims in the design of the DC-7 were to obtain a higher speed, increased range and a greater payload. 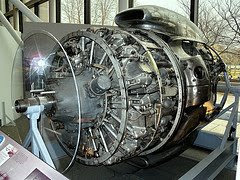 These were made possible largely through the adoption of Wright Turbo-Compound engines,^ very extensively developed and used by the Armed Services | before being made available for commercial use. The Turbo-Compound consists of a basic R-3350 18-cylinder two-row radial engine, with, the addition of a "power-recovery" unit between the power section and the supercharger section. This comprises three blow-down turbines, each driven by the exhaust gases from six cylinders: power generated by the turbines (due to the exhaust gases passing through the turbine blades) is transmitted through a fluid |coupling to the main crankshaft, augmenting the engine's output by some 600 h.p.In general the introduction |f the new power plants has caused few snags, although some nozzle-box cracking and cooling-cap failure has been experienced. During the life of the engine, modifications have been incorporated, including re-designed nozzle-boxes, the armouring of the turbines, better cooling and other detail changes. The new engines gave the following increases in performance ompared with the Double Wasps of the DC-6B: maximum cruise power, from 1,200 to 1,800 b.h.p. per engine; maximum continuous power, 1,900 to 2,650 b.h.p. ; and maximum take-off power, 2,500 to 3,250 b.h.p. per engine. To absorb the Turbo- compound's extra power, specially built Hamilton-Standard 4E60 four-bladed solid-dura! airscrews were used. 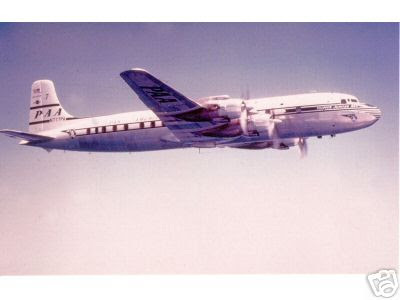 An increase n their diameter over the 13ft 6in of those on the DC-6B would have raised the noise level within the passenger cabin, andso this dimension was retained. 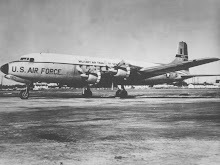 The aditional weight of the power plants was balanced by 14in extension in the constant-section portion of the fuselage aft of the wing rear spar (it may be recalled that the development f the DC-6A and DC-6B had been accompanied by an extra 0in in fuselage length forward of the wings). Extra room in the undercarriage bays was obtained by moving forward the firewalls f the inboard nacelles by 4in; although the tyres fitted to the early versions of the Seven are the same size as those on theDC-6B, the new bays are large enough to accommodate the bigger tyres of the heavier, trans-oceanic DC-7B. i might be expected, the larger, faster DC-7 is heavier, too, compared with its predecessor. All-up weight has increased from 107,000 to 122,200 lb and landing weight from 88,200to 95,000 lb. The fuel capacity remaim,.at 5,512 gallons, the same as that of the DC-6B, although for short-range operations 4,512 gallons only are carried. The use of titanium for engine nacelles and firewalls is one of the new design features of the 'Seven. Not only do they give an improved strength/weight ratio (a saving of 260 lb over steel nacelles has been accomplished) but their manufacture has also provided valuable experience in the techniques of using titanium in relatively simple structures. 1T was, in fact, found possible to form the titanium components—which amount to 88 per cent of the aft nacelle of each engine, or a total of 350 lb per aircraft—with no more difficulty than those of stainless steel. Another interesting item is the ingenious carburetor air scoop shown diagrammatically on page 147, and intended to give a more precise control over intake air and consequently to minimize the danger of carburetor icing. The three sources of intake air are (1) through the conventional ram scoop; (2) through the auxiliary scoop; and (3) through the hot-air duct from the engine. 4,000ft/min (with power on) are possible. A close approach at cruising altitude to the airport is therefore permitted, with consequent reduction in landing time; and the brake is available to slow the aircraft down on encountering turbulent conditions. The pilot's air-brake control, separate from the normal undercarriage- lowering mechanism, consists of a single lever which releases the main wheels which then drop into the locked position under gravity. A conventional hydraulic system is used either to lower both nose and main wheels simultaneously, or to lower the nosewheel after the main wheels have been dropped into the locked position as an air-brake. 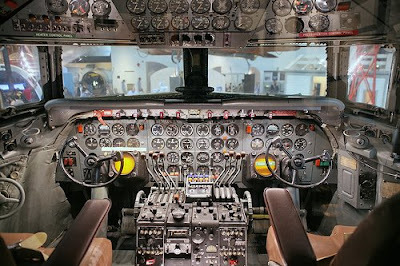 Cockpit warning signals, a senior Douglas engineer has emphasized, operate in the conventionalmanner and are not affected by dropping of the main wheels for braking effect. It is a fact, also, that the main undercarriage control lever over-rides the speed-brake control at all times. power plants); and, on later machines, the amended front spar undercarriage fitting mentioned earlier. from Chicago to Los Angeles. He has recorded the following impressions. QUITE a number of DC-7s are now operating across the United States, but they are still sufficiently special to receive extra publicity and attention. The services they fly are very much the mainline flagship type and, because the public cannot readily spot a Seven among the many Sixes, the number is usually painted very large on the tail. The husky-voiced girls announcing flights, too, usually seem to manage a special purr for a Seven departure or arrival. I spent an interesting day studying the activities at Chicago,America's busiest airport, which often has to handle a movement a minute, and it was no hardship that American Airlines' Flight 55 was called late, owing to weather and other difficulties at Detroit. We passengers climbed aboard at 6.30 in the evening forty-six of us in this 54/60-seat luxury airliner—and prepared for a 6i-hr non-stop flight to Los Angeles. The DC-7s are, of course, built at the Douglas Santa Monica plant, within a mile or two of the terminal. With the help of some ingenious jigging, DC-6s and DC-7s come down the same production line and have been doing so until the grand total has now reached over 500. 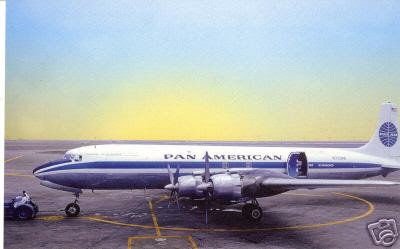 American Airlines, enthusiastic operators of the earlier DC-6s, feel that they had some influence on the design of the DC-7s (they have had a long association with the company while operating 3s and 4s as well) and they were the first to place an order for 25 of them cash down. All should now have been delivered. The seating figure of 54/60 quoted above indicates that 54 seats are usually offered on this service, but the seats in the lounge can also be sold when necessary. Once installed in the spacious cabins of the DC-7 we had very little time to wait before the engines were started. They came to life smoothly and quietly and the air conditioning could be sensed at once. The foam-rubber seats were comfortable and easy to adjust, but even more between-seat elbow room would have been welcome. The foot room is adequate and rubber-bar rests are provided. During the pre-flight check period I noted the attractive cabin decoration. The colour scheme is blue and goldy-fawn; leather trimming is used, and there are red carpets. The nose came well up to unstick, as the passengers could tell, and the climb was a little steeper than average. Once settled on the climb the captain broadcast a quite long speech of welcome and a description of the flight ahead. He explained the unusual exhaust flames, mentioned the gear* change, and finished up with a word or two about the weather report. All this (from public-address speakers in the roof) was audible to most of the passengers in spite of the engines being at climb power. So long as we climbed and cloud was to be seen the "fasten seat-belts" signs were kept on. We appeared to level out for a short time at about 6,000ft and then climbed on to 14,000ft. An occasional shudder was felt as we flew through cloud tops, but otherwise all was calm. The colours from the last sun were quite magnificent—red-tinted tops ahead and a huge amber floodlight to the rear. The exhaust turbines threw out an attractive blue-to-purple plume that showed brightly in the half-light. . The wing looked very large through the square window and sometimes it could be seen gently flexing. Small white spotlights shone from the fuselage on to the outer nacelles. American towns look extremely colourful from the air at night. This is partly due to the clear atmosphere, but mainly it is because more and brighter red and green all-night neon signs are used than in other countries. Because the front row or two of seats between the engines are in a rather noisy area, even more soundproofing has been added and the noise level is now acceptable. There is no comparison with turboprop types but the Seven is as good as, or better than, anything else in its class. Centrally there is very little noise or vibration; well aft, air noises and some buzzing type of vibration can again be felt. The highest point of our flight was in the region of Denver, when we reached nearly 20,000ft. Later a long let-down brought us over Los Angeles in position for the straight-in approach and landing practiced widely in America. This seems to be a big improvement on the tortuous cross-country often needed to get into London Airport. The actual time in the air was only 5 hr 45 min and the cruising speed was 310 m.p.h. Formalities on landing after 5f hr in the air (and two hours back on the clock in changing from Central Time, through Mountain to Pacific Standard, were negligible. The luggage was quickly produced, but the walk from aircraft to terminal was long and the wait for the hourly bus even longer. I thought about the alternative $4 taxi to the hotel, and decided that the London coach system was perhaps better as well as cheaper, though the American coaches or limousines do call at hotels instead of at a city terminal, and this is more convenient for most long-distance passengers—particularly for early morning departures. It is not surprising that so many Americans travel by air. The internal services are usually quick and efficiently run and the fares are, as a percentage of average salaries, relatively cheap—though tips to porters add up to a substantial figure. This long non-stop DC-7 service—and there are similar ones coast-to coast—was both luxurious and rapid. For an American, it costs the equivalent of about £15 if one converts from dollars and allows for the triple-salary figure with a cost of living very much higher than in this country. Main factors in the operational and economic performance of the DC-7 are indicated in the diagrams and tables above and below on this page. The machine's performance over typical routes (from 600 to 3,000 mile stage-lengths) shows favourable block-times, at least when compared with those of other piston engine types, and low unit costs. The Seven is certainly an efficient all-round airliner in the long-range category, and will only be surpassed in speed and economy during the next few years by machines such as the Comet 3, Boeing 707 and Britannia. The DC-7 was introduced into commercial service in the U.S.A. by American Airlines on November 29th last, since when it has broken a number of inter-city transport records on the American continent. 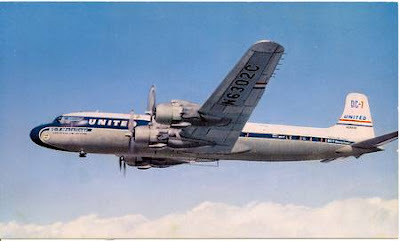 Following American's order for 25 machines came further orders for DC-7s and 7Bs from United Air Lines (25), Eastern (12), Delta C and S (10), Panagra (5), National (4),and Pan American (7). Aerodynamic flight-testing of the DC-7B, long range "intercontinental" version of the Seven, has recently been taking place over the Californian desert, and final C.A.A. certification tests are to begin in September. The most significant change is the use of a new flap-linkage system together with a re-positioning of the flap itself to give improved airflow characteristics. Another development is the provision of extra fuel capacity by the addition of "saddle" tanks forming part of the enlarged engine nacelles, and the optional increased capacity of the centre-wing trailing-edge tanks. The resultant total fuel capacity of the DC-7B is 6,400 gall, and the gross weight of the new aircraft has been increased from 122,200 lb to 125,000 lb. Its engines are the DA4 versions of the Turbo-Compound, which give a power increase over the earlier DA2s of 100 h.p. under all conditions except take-off. Alternative cabin layout will cater for 40 passengers in the luxury version, or up to 95 for tourist services. Using a 52-seat layout, and allowing for cargo, baggage and mail, the DC-7B (it is reported) will be able to fly 4,000 miles non-stop, with a fuel reserve of almost 1,000 gall. Non-stop London-New York services are a possibility. air-transport business. The Seven, like its forerunners, should continue to transport passengers regularly, efficiently—and profitably—for its operators during a good number of years to come. To the author of this fine web site regarding the DC-7. It is nicely done. I enjoyed it. Having spent 100's of hours flying the DC7, such web sites bring back memories. Some a bit too exciting to be fond. After forty years in the flying business (8 as a navy pilot and 30 flying for one of the largest airlines) and then after 10 years into retirement, I found a fascinating book about the DC7 by an expert on its development which insinuated what must have been inside information regarding a serious (and probably known only to a few) potential problem in the DC7 design. I know from first hand experience. While flying a full load of passengers this problem came "that close" to killing us all. During the hearing (that followed this nasty incident), many of the true facts were revealed (but not in their entirety). If you are interested in what I know about them, I will be glad to share. Contact DC-7 pilot at E-mail: http://saviapproach.tripod.com/ After hearing my facts regarding this little known but serious problem, maybe you can shed further light on what I feel is an intriguing, and continuing mystery regarding the DC-7. I still wonder why the -7 had the four bladed prop. Also believe that the -7 was never the plane the -6 was, even to this day.